Anna Maria Island dolphin tours are famous throughout the world and are one of the most exciting attractions and family friendly activities to enjoy while you’re vacationing here! These tours provide you with an excellent opportunity to see the dolphins that live in the Gulf waters around the island from one of the safest and closest vantage points that you’ll find. 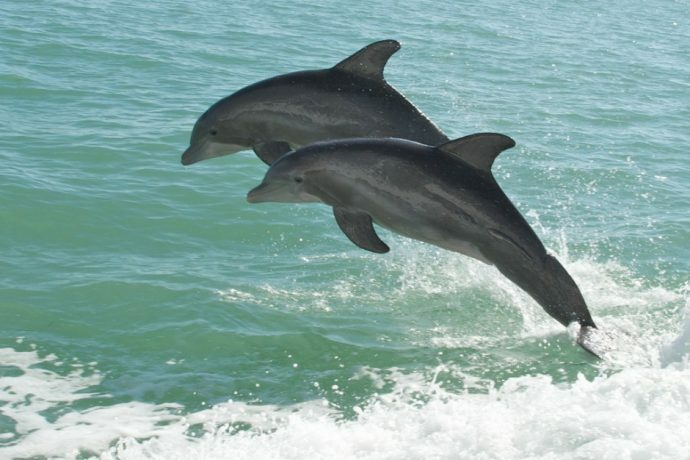 Anna Maria Island dolphin tours are easy to book and can fit right around your schedule. With several experienced local providers available to handle your tour, you can easily choose one in a location close to your Anna Maria accommodations. You have the option of choosing kayak or canoe tours, paddle boat tours, or boat tours, depending on your preferences. All of these tours are family friendly, including the kayak tours where parents can bring young children along in 2 person tandem kayaks. Those who have experienced the dolphin tours of Anna Maria Island will tell you how truly exciting and memorable they are. The boat tours take you on high speeds through some of the most scenic waters around the island and can be fully customized based on the areas you want to see. Dolphins will be right next to you whether you choose a kayak or boat tour, and you’ll have some excellent opportunities to take photographs and videos. During your ocean excursion, your tour provider will also give you some enlightening information about the dolphins, the local wildlife and why the area is such an important habitat for them. The tour provider also do their best to make the tour entertaining for younger children as well, keeping it interesting for all ages. You can also get some great low prices for most of the dolphin tours on Anna Maria Island, along with flexible hours and options depending on the size of your group. Discounts are typically available for families or group purchases, and the boats are large enough to bring at least 6 people or more on. You can also often combine different types of tours together such as fishing charters and dolphin tours, shelling and dolphin tours, ecology and dolphin tours, and others. To help you plan your next tour, choose from these dolphin and whale watching tour providers located near Anna Maria rentals. Call during their normal business hours to get more information about the specifics for each type of tour they offer. MV Minnow Boat Tours whale watching and dolphin tours, sunset cruises, private event charters and excursions to Egmont Key. YOLO Adventures offers a range of outdoor activities to participate in such as dolphin tours, parasailing, sight-seeing tours, and much more. Happy Paddler Kayak Tours is one of the top providers for kayak dolphin and wildlife tours of Anna Maria Island in protected waters that boats can’t access such as coastal mangrove and river areas. What Is The Distance from Anna Maria Island to Sarasota?